Much like the art piece from Prada, another luxury brand is experimenting with existential themes in the medium of short film. OK, OK, it's a commercial. But with angst! Beauty, ennui, fuzzy, unfocused camera work and faces slipping out of the frame. In fact, it's so much of a mood piece that you barely see overpriced crap they're trying to push. But this brand, while popular, could really use re-positioning. And this gorgeous, teasing commercial could be just the thing. We're not naming the brand, but if you pay attention, (or skip to the end) it's obvious. A frame-by-frame breakdown, after the jump. And this sleeping redhead. She's holding a CLUE! 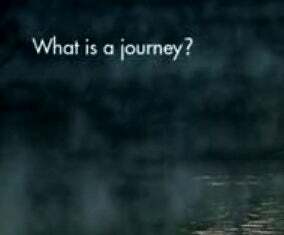 So yeah, what is a journey? You think you know, don't you? You think a journey is a trip. Wrong! A journey is not a trip. Now check out this boat in the mist. But don't forget the question, about the journey. You're thinking it's like, a vacation, right? Wrong! It's not a vacation. But this narrow little street is cool. But this narrow little street is cool. Anyway. Back to the journey. It's a process. A discovery. We know this because the text tells us so. And! It's a process of self-discovery. See what they did there? No, we don't know who these people are. ...but how we fit in it. It is no accident that this guy appears to be leaning. Who is he? We'll never know! But he's important. He's you. Maybe. Does the person create the journey? Well yeah. The person has to book the tickets, the hotel, the rental car and whatnot. Oh, unless you have "people" to do that for you. Is that what they mean? Hmm, guess that's not what they mean. OK. So does the person create the journey, or does the journey create the person? Way existential. What we need right now is a guy to make us make you nostalgic for a life we've never known. The journey is life itself. Aww. Sweet. Something you can relate to, even if you do not possess airline reservations at the moment. You possess a heart, you are alive. Good work. Wait! There's a BIG HINT coming!